How y’all doing, forex friends? The Bank of Canada (BOC) decided to maintain the overnight rate at 0.50%, but the Loonie got slammed by sellers. Well, here are the major highlights from the BOC Statement and presser that you need to know about. But as I noted in my latest Economic Snapshot for Canada, Canada’s CPI grew by 1.2% year-on-year in November, which is the weakest reading in 31 months. 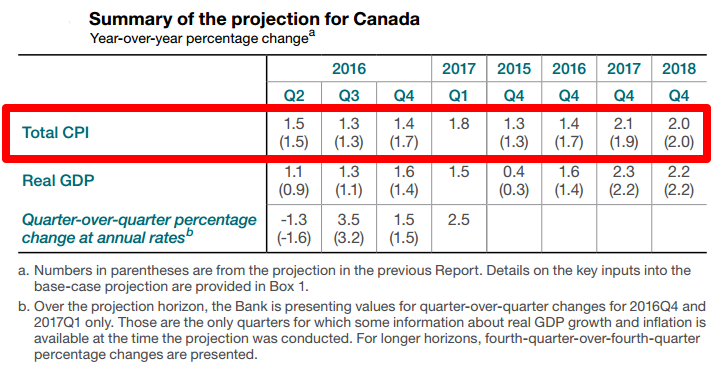 The BOC’s 1.4% projection by December is therefore actually an acceleration from November’s very poor reading. So far, so good, right? Well, it goes downhill from here. Year-on-year, however, the BOC upgraded its 2016 GDP forecast from 1.4% to 1.6%. 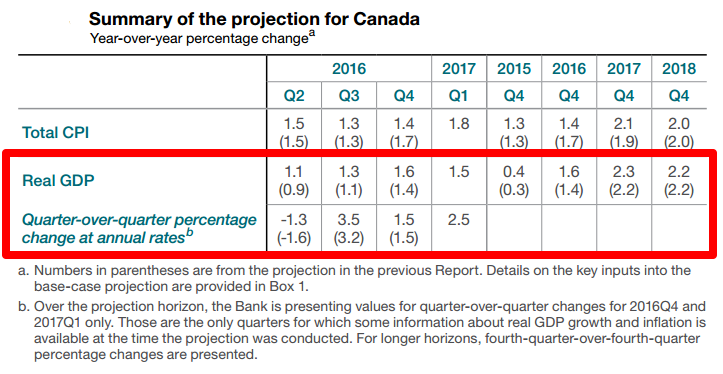 The BOC also upgraded its 2017 forecast from 2.2% to 2.3% while the projection for 2018 was unchanged. And according to the BOC, growth in 2017 and 2018 would be fueled mainly by household spending. The BOC also expects a “modest expansion” in investment and exports. But with regard to exports, the BOC warned that “Export growth will be limited by the recent appreciation of the Canadian dollar, alongside that of the US dollar, vis-à-vis most other currencies.” In short, the BOC thinks that the Loonie is too strong. But despite the growth upgrades, the BOC also warned that “the outlook needs to be viewed in the context of elevated policy uncertainty at the global level,” especially from the U.S., Canada’s main export market. The BOC is worried that the rise in bond yields of developed economies, particularly the U.S., may continue to siphon capital away from EMEs (emerging market economies). This could ultimately drag down the global economy, the BOC says, which would then also drag down the Canadian economy with it. According to the BOC’s Monetary Policy Report, “risks to the projected path for inflation are roughly balanced.” However, the report acknowledged that “the outlook is subject to considerable economic and geopolitical uncertainty.” And we already discussed some of them. 6. BOC now has an easing bias? BOC Governor Stephen Poloz was asked during the presser if the BOC was “on track” for a potential rate hike before the U.S. elections. And Poloz simply answered “no”. By the way, Poloz is referring here to Canadian PM Justin Trudeau’s infrastructure program. Given the recent, positive economic developments in Canada, expectations were high that the BOC would maintain a neutral tone, or even be more upbeat. Instead, the BOC was rather dovish, and BOC Governor Poloz even hinted that the BOC now has an easing bias. Some market analysts are even saying that the BOC is likely signaling that it’s open to using unconventional monetary policy tools (such as QE or negative rates), given that the overnight rate is close to zero. Anyhow, it should also be noted that the Loonie also likely got dragged lower by the convenient (for Loonie bears anyway) slide in oil prices at the time, as you probably saw on the chart earlier. And market analysts attributed yesterday’s slump in oil prices to renewed oversupply worries due to higher U.S. oil output.